The team behind Creative Events Perth are excited to announce the debut of Perth’s latest music and socially inspired event REVERB. Set to take place in the glorious Autumn month of April, REVERB celebrates WA’s love of the great outdoors with three days of music, food fair, beverages, open skies and community vibes… all presented in the picturesque cityside parklands of G.O Edwards Park, Burswood WA. REVERB kicks off the weekend and launches into full sunset swing on FRIDAY 13 APRIL 2018, starring an absolutely superb line-up of Australian indi rock & electro flavoured pop to break out the champers to! Following the release of new single “The Others”, the first track the band has released since 2016’s critically acclaimed album, Synthia, THE JEZABELS the band show a return to form that cannot be denied. 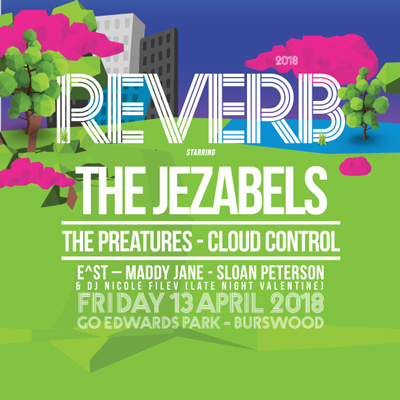 With 2018 festival performances at Melbourne’s St Kilda Festival and Sydney’s Twilight at Taronga, REVERB is very proud to announce THE JEZABELS return to Perth as our Friday opening night headliner. Sydney rockers – THE PREATURES require no introduction to WA, with performances at 2017 Groovin The Moo, Rottnest’s Castaway, and numerous headline shows since their formation in 2010. Following the release of their critically acclaimed 2nd album in 2017, first single and title track to the record “Girlhood” has taken fans by storm. The follow up track “Yanada”, which pays respect to the local Indigenous community in Sydney and has swiftly become a crowd favourite. Having performed at many of the world’s most respected music festivals including Coachella, Glastonbury, Bonarroo, Splendour In The Grass and Pentaport in Korea… THE PREATURES make a welcome return to Perth to join an all-star cast for REVERB. Cloud Control's third, and first self-produced album, Zone, is their most cohesive, complex and personal release to date, full of colour, space and undeniable tunes. The new single 'Panopticon' from Zone follows previous radio hit singles 'Rainbow City' and 'Treetops'. In support of her excellent single ‘Life Goes On’, Australian teenager, songwriter and nonconformist E^ST is heading to Perth for REVERB! In addition to her scheduled Perth performance, E^ST has also shared a remix EP which features new interpretations of her single ‘Life Goes On’, put together by KC Lights, Twilo, and her pal Alice Ivy. It’s been a massive 12 months for MADDY JANE with break out singles ‘Thank You and Sorry’, ‘No Other Way’ and ‘Drown It Out’ getting high rotation on national broadcaster jjj. Sloan Peterson; a love child of 50’s guitar pop and modern garage rock, bursting with a warmth that’s inseparable from her private identity. Influenced by everything from Elvis, to Wanda Jackson or the fashion statements of Nancy Sinatra and Bowie – SLOAN PETERSON is the sum of these influences that adds up to so much more. Following performances at Sounds of the Suburbs, Lost Paradise, The Plot and Bigsound, and east coast tours with Alex Lahey and Holy Holy, SLOAN PETERSON cruises across the Nullarbor this April for her WA debut to perform at REVERB. NICOLE FILEV is a well-respected female DJ in the Perth music community, well known for her tasteful selection of underground boogie, effervescent presence & delivery of eclectic sounds to take listeners on an exhilarating journey unlike any. RTRFM presenter, 1/3 of the Din Daa Daa Collective, is half of live music duo Intercontinental Sounds and the creative mind behind fashion/event label Gala Apparel, NICOLE FILEV is a busy girl indeed, and we are excited to have her bring her awesome Late Night Valentine party vibes to REVERB. We rock… rain, hail or shine! *Offering a fully cashless festival we aim to stray from the typical festival bar and food queues and not only provide fast efficient service but also take the step towards creating a sustainable paperless environment. Over 18's only unless advertised otherwise. Photo ID is essential,­ acceptable ID is a current and valid Australian Photo Drivers Licence or Passport.